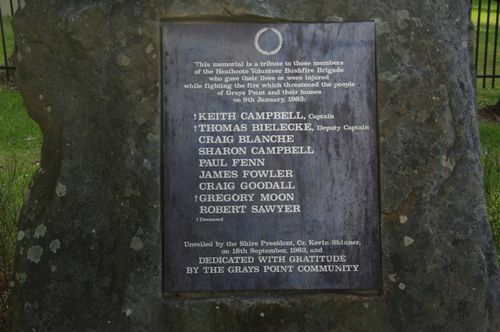 Memorial erected to brigade members who gave their lives whilst fighting the fire which threatened Grays Point, and to brigade members who were injured in the fire. Tragedy was to strike on 9th January 1983 at Grays Point when a fire burning under record high temperatures (maximum. 43 C) was to trap the crew of Heathcote 81 with the death of three of the crew and serious burns to other crew members. This was to result in the longest coronial enquiry in New South Wales history. Heathcote Tanker 81 was a 1964 Bedford RLHC 4x4, essentially similar to the Headquarters 81 Tanker destroyed in the same area 3 years before. The tanker and its 10 crew was one of a number of vehicles engaged in fire suppression in bushland on "Anana Hill". All the vehicles were ordered clear as changing conditions made the hill dangerous.